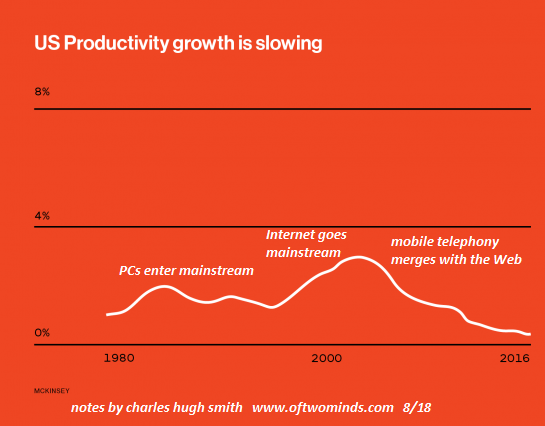 Of Two Minds - Why Is Productivity Dead in the Water? The only possible output of this system is extortion as a way of life. As the accompanying chart shows, productivity in the U.S. has been declining since the early 2000s. This trend mystifies economists, as the tremendous investments in software, robotics, networks and mobile computing would be expected to boost productivity, as these tools enable every individual who knows how to use them to produce more value. One theory holds that the workforce has not yet learned how to use these tools, an idea that arose in the 1980s to explain the decline in productivity even as personal computers, desktop publishing, etc. entered the mainstream. A related explanation holds that institutions and corporations are not deploying the new technologies very effectively for a variety of reasons: the cost of integrating legacy systems, insufficient training of their workforce, and hasty, ill-planned investments in mobile platforms that don't actually yield higher productivity. Productivity matters because producing more value with every unit of energy, every tool and every hour of labor is the foundation of higher wages, profits, taxes and general prosperity. I have four theories about the secular decline in productivity, and all are difficult to model and back up with data, as they are inherently ambiguous and hard to quantify. 1. Mobile telephony and social media distract workers so significantly and ubiquitously that the work being produced has declined per worker/per hour of paid labor. 2. Public and private institutions have become grossly inefficient and ineffective, soaking up any gains in productivity via their wasteful processes and institutionalized incompetence. 3. Our institutions have substituted signaling and compliance for productivity. 4. The financial elites at the top of our neofeudal economy have optimized protecting their skims and scams above all else; their focus is rigging the system in their favor and so productivity is of no concern to them. Other commentators have noted the drain on productivity as workers constantly check their mobile phones and social media accounts--up to 400 times a day is average for many people. "Addicted" is a loaded word, so let's simply note the enormous "able-to-focus-without-interruptions" gap between those who only answer phone calls and limit social media to a few minutes per day in the evening during off-work time, and those who are distracted hundreds of times throughout the day. Some tasks can be interrupted without much loss of productivity, but most knowledge-worker type tasks are decimated by this sort of constant distraction--even though the distracted worker will naturally claim that their productivity is unharmed. The list of public institutions that now demand absurd wait times for minimal or even defective service keeps growing. The California Dept. of Motor Vehicles (DMV) now soaks up to eight hours of waiting to complete mundane tasks. Employees have been caught napping for hours, and customers waiting for service note the lines finally start moving in the last half-hour of the day when the employees are motivated to process the people in line so they can go home. The other public-sector systems are equally Kafkaesque; building permits that once took hours to process now take months, and so on. In the private sector, it's becoming increasingly difficult to fix problems created by the corporations themselves: multiple phone calls, long wait times, etc. The core dynamic is that public institutions and corporate cartels lack any mechanisms to enforce transparency and accountability; there is no competitive pressure on the DMV or courts, and essentially zero competitive pressure on monopolies such as Facebook and Google and cartels such as the big healthcare insurers. The only possible output of this system is extortion as a way of life: we make you wait, we make you pay more for a poor quality service, we make you comply with useless regulations, we make you use buggy, bloated software, and so on. Quasi-monopolies like Microsoft and Apple force tens of millions of users to re-learn new versions of software, detracting from productivity rather than enhancing it, despite their claims. Other types of planned obsolescence are equally destructive. With no mechanisms in place to enforce accountability and efficiency, there is no accountability or efficiency. And so these monopolies and cartels can be as wasteful, inefficient and unaccountable as they want. Compliance is a productivity killer. Doctors and nurses no longer have enough time to serve patients because compliance now soaks up so much of their time. If we look at the economy as a whole, we find it is dominated by monopolies and cartels, public and private. No wonder overall productivity is declining: there are no feedback loops or mechanisms to enforce transparency, accountability or pressures to improve efficiency and productivity gains on these neofeudal, extortionist structures. Thank you, Ron G. ($50), for your monumentally generous contribution to this site -- I am greatly honored by your steadfast support and readership. Thank you, Prentice W. ($50), for your superbly generous contribution to this site -- I am greatly honored by your steadfast support and readership.